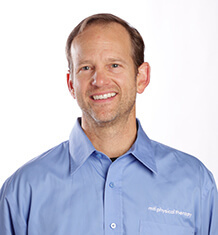 Dan has been practicing physical therapy in Washington State since 1999 and has worked for MTI Physical Therapy since 2002. He is currently a Clinic Manager at MTI Physical Therapy’s Kirkland clinic. Having the unique opportunity to graduate Physiotherapy school from the Hanzehogeschool Van in Groningen, The Netherlands, he became motivated to further pursue manual therapy assessment and treatment skills. He subsequently went on to complete Level 3 of the North American Institute of Orthopedic Manual Therapy. Having played Premiere Select level soccer from childhood into University, he appreciates the benefits of exercise dosage, training plans and preparation, and teamwork to achieve personal goals. Dan provides a well-rounded approach to genuine patient care by drawing upon his education and his professional experience, including working at Golden State Rehabilitation Hospital and for the NHL San Jose Sharks in Media Relations. Dan‘s interests included cycling coaching/training, previously racing for Cucina Fresca Cycling Team 2008-2013. In June 2011, he traveled to the French Alpes to ride the above category Tour de France mountain passes including Alpe d’Heuz, Col de Galibier and Mt. Ventoux. In September 2012 trained in Girona, Spain where many of the European based professional cyclists live and train. His other interests are weather and Biometeorology, and supporting the Seattle Sounders FC soccer team. Lake Washington Youth Soccer Association U10 and U12 soccer coach.